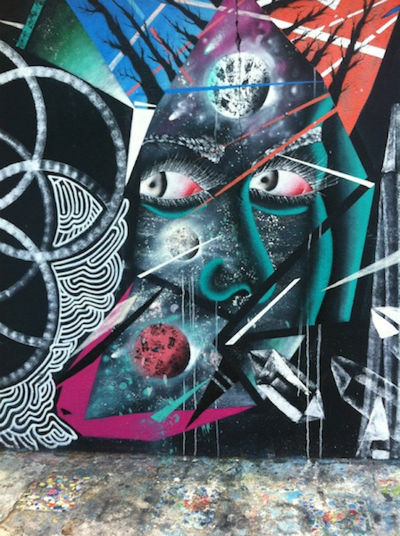 San Francisco artist Irene Dogmatic visits São Paulo's mainstream art galleries, which she found surprisingly short of visitors, in striking contrast to the city's vibrant street art scene. Recently I visited São Paolo, Brazil, and was fascinated by the rich cultural heritage there. 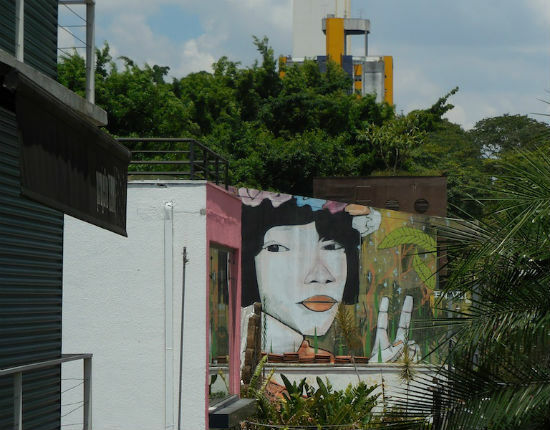 São Paolo is a South American version of New York City, richly cultural, fascinatingly urban, and tropical as well. It is the third largest city in the world, with only Bombay and Mexico City being larger. I was amazed by two aspects of visual culture in São Paolo. I didn’t have tons of time to explore, since I was only there for about a week. That was long enough to be aware of what seemed to be either a disconnect or a tie about the art there, depending on how you view it. I was determined to take in as many museums as possible, but also saw lots of great street art from taxis and from the family car of the folks I stayed with part of the time. The museum that gets most visitors is the MASP or Museum of Art São Paolo, which is on the Avenida Paulista, sort of like São Paolo’s version of 5th Avenue in NY. I like the way their historic European and Brazilian Art is displayed. Each painting is hung by wire from the ceiling, and the curator stated that this was to make it more “people friendly,” maybe because you can move around the art. It was by no means the most interesting art museum I saw. That would likely be the Museu Afro-Brasil, in Ibirapuera Park. This museum is dedicated to the African-based population of Brazil, and has a history of five centuries of African Immigration on its third floor, which includes information about how the African slaves contributed to Brazil’s cultural heritage. I missed quite a bit of it since I don’t speak Portuguese, but the photos and paintings tell a lot. Not a pretty story: 10 million died over 5 centuries. The rest of the museum is amazingly colorful and diverse. Being the gringo I am, I was taken by a display of beer produced by African slaves in Brazil. I also saw a huge collection of historical artifacts from Carnival, including gorgeous beaded costumes, masks and painted motorbikes. There was a lot of contemporary African art, including three large 21st century colorful abstractions from Benin, as well as two travelling exhibits of paintings, one of a pop-inspired Brazilian artist named Fernando Ribeiro, who does humorous takes on art history, and another of the work of Duda Penteado, whose work reminds me somewhat of Basquiat and Picasso. There were practically no visitors to the Museu Afro-Brazilian the day I was there. I talked to one of them, a tourist from France. I also visited a museum in the Luz district. 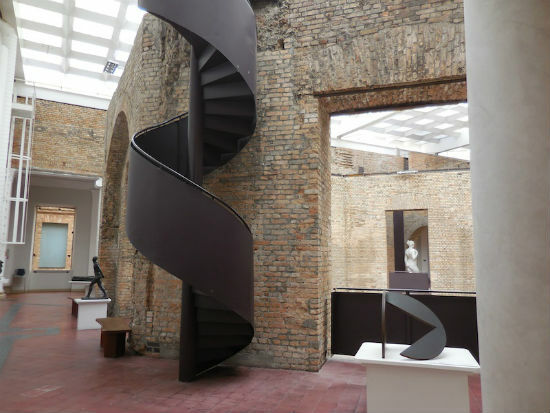 This was the Pinacoteca do Estado set beside a park, and housed in a beautiful exposed brick building. It has a great collection of Brazilian art, mostly from São Paulo, as well as a large contemporary collection. It was almost deserted the day I was there. MAC-USP, or Museum of Art Contemporary, of the University of São Paulo, was also wonderful, deserted and free to all! My favorite piece was a huge interactive Cat Sculpture by an artist named Nina Pandolfo. It is made of plush, and purrs and begs to be petted. It is about ten feet long. The museum also had an interactive ecological exhibit, plus one floor devoted to Brazilian historical art. It is fairly new, and had no bookstore, no café, but amazing views of São Paulo from the roof! The place too was practically deserted. I call this piece lost and found art in Sao Paulo because to me it seems that São Paulo is absolutely crawling with great art, both in museums and on the street, and it appears that no one notices. In Europe, the museums are packed with tourists. The museums in São Paolo were empty, except MASP, and that was probably due to its central location. 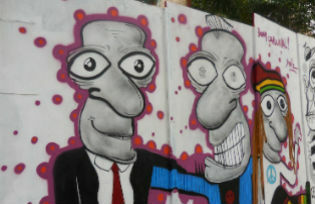 There is one street and district in Sao Paulo that is famous for its street art. It is Batman’s Alley, or Beco do Batman. It is the area around Rua Gongalo Alfonso and Rua Medeiros de Albuquerque in the Vila Madalena neighborhood of the Pinheiros(Pine Trees) district. It is a collection of streets with large colorful murals preserved by the people who live in the neighborhood, an upper-middle class part of town with a bohemian reputation which houses galleries, clubs and people eager to live in an artsy area. It has become a tourist draw because of the large concentration of street art there both in Batman’s Alley and the surrounding area. The name seems to have come from a graffito painted on one of the walls in the 1980’s. Batman was the name used by the artist who did it. Art students and artists have been filling the area with beautiful art since then. It is continually changing. In 2010, the mayor of São Paolo passed a “clean city” law that got rid of billboards. Unfortunately it also got rid of a lot of street art, but from what I saw of the city, there is still plenty around, lurking on corners where you might or might not expect it. Street Art always addresses a multitude of styles, ideas, and viewpoints, and Batman’s Alley is no exception. It is a means of visual communication by which artists get their thoughts out to the public, often in the only way they can, on walls. In Beco do Batman I saw the blue Indian image by an artist named Cranio. Cranio uses the image to convey tensions between rural and urban life in Brazil. I saw a lot of other beautiful images there, including a mysterious black woman’s face . As with all visual art, these images are open to interpretation. Some are easy to figure out, especially for Brazilians, but all of the street art I saw, whether I understood the artist’s point of view or not, was beautiful and /or colorful. 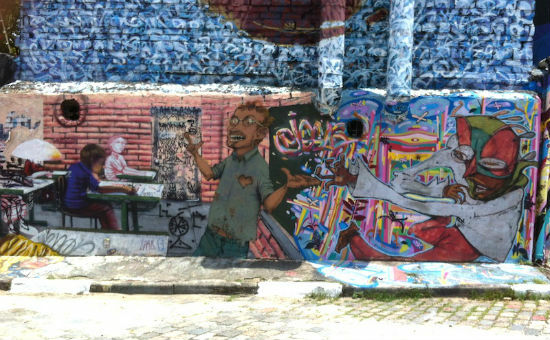 So the point of calling all of this “Lost and Found” is that there is a lot of terrific imagery in São Paulo, both in art museums and on the street, and it seems that with the exception of Batman’s Alley, a lot of it goes unnoticed by both locals and tourists.